This is the last post for “Sundry Times”. Writing and posting something at least once a week for five years has been an interesting challenge. Having the possibility of sharing on this blog, I have learnt to look through a camera differently; no longer just taking snapshots and landscapes but also looking for curious shapes and patterns. I have dared to share some of my poetry – I don’t claim any particular merit but I have taken a bit more care over them, sharpening phrases, typesetting lines etc with the thought that someone just might want to read them out loud. And I have mixed all this up with prayers, politics and jokes in the believe that “It is all of a piece”: we have one life with many accents and colours but not separate holy, secular, spiritual, natural, work and home lives. I hope that you have found something of value here, some gold among the grit. The main reason for “Sundry Times Too” is that I have more or less used up all the memory here so I need some space for more photos. The other reason is that I started this blog as a way out of a nervous breakdown. I still have my “unexpected lows” but I am in a much better place than I was in 2010 but I want to mark my moving on by moving on to another, though similar blog. Almighty Father, your will is to restore all things in your beloved Son, the king of all. Govern the hearts and minds of those in authority, and bring the families of the nations, divided and torn apart by the ravages of sin, to be subject to his just and gentle rule. Amen. … and God bless us all. until you call us all to reign with Christ in your eternal kingdom. It has been over four years since I started this little venture so I decided to freshen things up a little. Whether or not you like the changes the content is much the same! Vote for the minority party of your choice! There is plenty of comment and news about the UK general election on the web and other media. I don’t propose to tell you whom to vote for. There are two reasons for this. The first is that while I do have political preferences (see here for the issues I think are most important), I would rather you made up you mind based on sound principles and values rather than by being nagged by someone like me. Secondly, I do not want one political party to have power alone; I much prefer it when parties work together. Despite some obvious failings (refer here to your particular issue), I think the Coalition has worked pretty well. The government has not fallen apart, the two parties were able to work together most of the time and yet fall out with each other from time to time. If they never argued I would have been more suspicious. Meanwhile we are told that we have a choice of only two who may become Prime Minister. While that is most likely, it is possible that another party could steal a march on the others unexpectedly. In thinking that we only have a choice of two it would easy to forget that the two (currently) largest parties are minority parties. Whichever party you vote for is a minority party. That is something that has changed in this country during this century. It has been suggested that if the “didn’t vote” part of the electorate were a political party they would be the largest of them all. And, yes, it too would be a minority party. So, if I were to give my fellow-citizens any advice it would be this: vote for the minority party of your choice, you do not have to choose one of the two bigger ones if you don’t want to. We like the freedom to choose – some of us in the UK will still remember when there were only three TV channels and they did not broadcast throughout the night. These days, not only are there more channels but with things like iPlayer we can decide when to watch our favourite programmes as well. With a box of chocolates, we like to choose our favourites and opinion is divided on whether coffee- or strawberry creams are yummy additions or vile interlopers among the other nicer chocolates. For me the ultimate chocolate choice is between a smooth truffle and a soft, liquid caramel that melts in the mouth. We also like the freedom to say what we think, to express an idea and to try to persuade others of our point of view. With a General Election coming up we will find people from various parties (and none) trying to get us to cast our vote in favour of their party and to support their ideas of what is best for the country. So arguments about broadcasting leaders’ debates are not just about the logistics involved in organising them but are also about how many differing voices and opinions get to be heard. Recently, there has been some controversy about “freedom of expression”. Some would argue that any and every opinion should be allowed to express itself no matter how stupid or unpleasant some may be; others would say that there are limits if, for example, someone is trying to incite violence or is encouraging others to commit a crime. On some occasions it is better to keep quiet. The hard part is saying who is to decide what you can and cannot say or when you can say it. If we nominate some public authority to tell us, we stand in danger of censorship that only permits a narrow range of opinion to be expressed. The result could be that some views are suppressed and we miss out on the unusual but useful idea. If we have no limits, then we lay the ground for unnecessary offence for some and hurt for others. Christians prize the freedom to be able to present the gospel to the world. They cherish the freedom to express an alternative life-style to the “rat race”; as well as offering alternatives to the violence we see in the world and to apparently limitless consumption. They want the opportunity to be able to point to Jesus: as our example to follow, as well as being our friend and saviour. Christians are in favour of freedom. I would say that that freedom of expression includes the freedom to speak out and the freedom to hold one’s tongue; freedom to poke fun at the pompous, freedom to respect those with whom we disagree. You may have the right to print rubbish but you are not compelled to do so, and we do not have to read it either. How should Christians decide what to say, print, or broadcast? I would suggest two simple principles based on these questions: is it true? That does not exclude jokes or fiction but does challenge us to be honest about our intentions. Secondly, is it in keeping with the two greatest commandments to love God wholeheartedly and to love our neighbours as ourselves? We may not get it right all the time but the freedom we are encouraged to seek is not the freedom to tell lies, it is the freedom to speak and live the truth about God. But now that I’m married I mostly hear only one question. I usually say something along the lines of “It’s good, I like it.” How do you answer this question? Marriage is so much more than good. I have had a hard time encompassing what marriage is like. 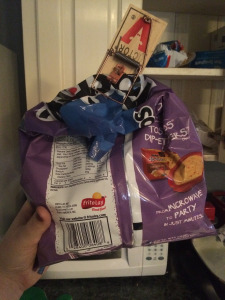 Today, I opened the cabinet to get a bag of chips and I found the answer to the question.